A porcelain incense burner of archaic gui form, supported on a short foot. The round sides curve in towards the rim. Two halberd-shaped handles are attached to the sides of the body. The censer is covered in a thick greyish blue glaze suffused with a network of black and faint russet crackle. Around the rim, where the glaze is thin, a russet colour is applied. The glaze stops neatly above the foot, revealing the dark, brownish body. The glazed base has three nail-like spur marks around the edge. The original Ge ware is historically considered one of the ‘five famous kilns’ of the Song dynasty (960 – 1279) together with Ding, Jun, Ru and Guan, as identified by early Ming scholars. Ge ware typically exhibits a thin body in dark clay, covered with a thick greyish-blue glaze, fully opaque with an almost matte finish. The glaze tends to be thin at the mouth, so that the lip appears dark; iron compounds in the exposed body clay of the foot fire a purplish–rust colour. These features are traditionally described together as ‘purple rim and iron foot’. Another main feature of Ge wares, known as ‘golden thread and iron line’, describes the two different colours of the crackle. The taste for Ge ware continued into the Qing dynasty, when old pieces were collected and new ones created. 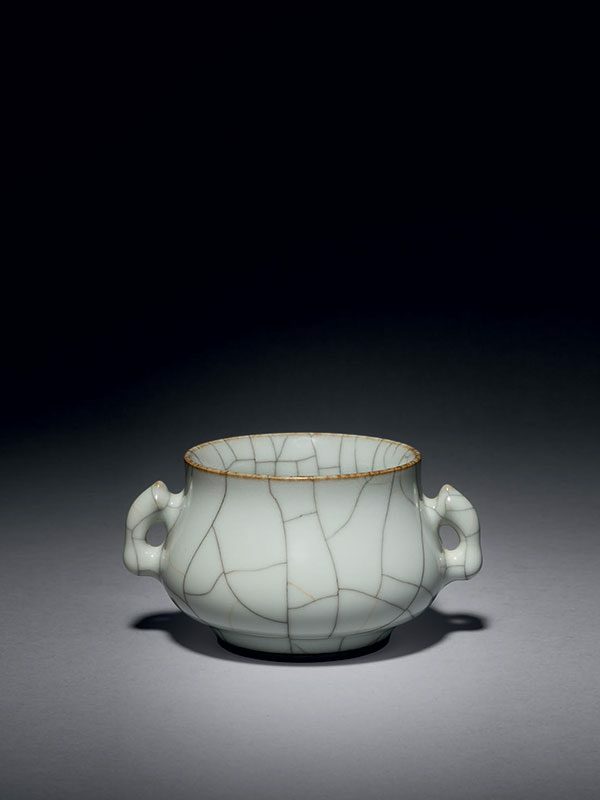 Stained crackle-glazed wares of Ge-type were made at Jingdezhen from the Chenghua period (1465 – 1487) onwards. The deliberately discoloured porcelains had iron pigments painted onto the foot and rim to satisfy the ‘purple rim and iron foot’ criteria. During the Qing dynasty, Jingdezhen copies of Ge ware were made with a high alumina, lime-alkali glaze, making them close to the original Song examples. The body is true stoneware that contains iron oxides and a low silica content that encourages crazing. Two Song dynasty Ge censers of comparable size and glaze from the Qing court collection are in the Palace Museum, Beijing. A further comparable Ge-type censer, dated to the Ming dynasty and with a similar ‘golden thread and iron line’ crackle, is in the collection of the National Palace Museum, Taipei.